AllTanksCom LLC sells high-quality plastic PCO Tanks. PCO (pest control operator) tanks are designed for a variety of uses, ranging from small volume transport to storage applications. The PCO plastic tank is a rectangular, self-supporting container with molded-in legs. They come in various sizes such as 50, 100, and 200 gallons. Flat areas on either end allow easy mounting of fitting connections. 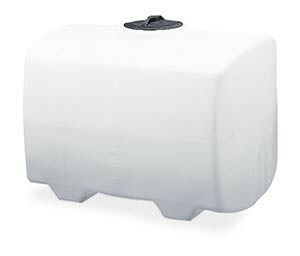 These tanks can be used as plastic water storage tanks or in many different applications, including: transport and storage, anti-freeze reservoirs in large equipment, agricultural sprayers, golf course weed and fertilizer distributors, ranch weed control and pesticides, nursery and lawn care, and more. These tanks can be used for pressure washer systems and may be truck, RV, and trailer mounted. They include self-supporting legs and do not require any saddles. Optional tie down bands are available.